It made me think about all of the homes Peter and I have shared in our 10+ years together. Our first true home together was Eileen. Eileen was my white Dodge Caravan… Yes! A minivan! 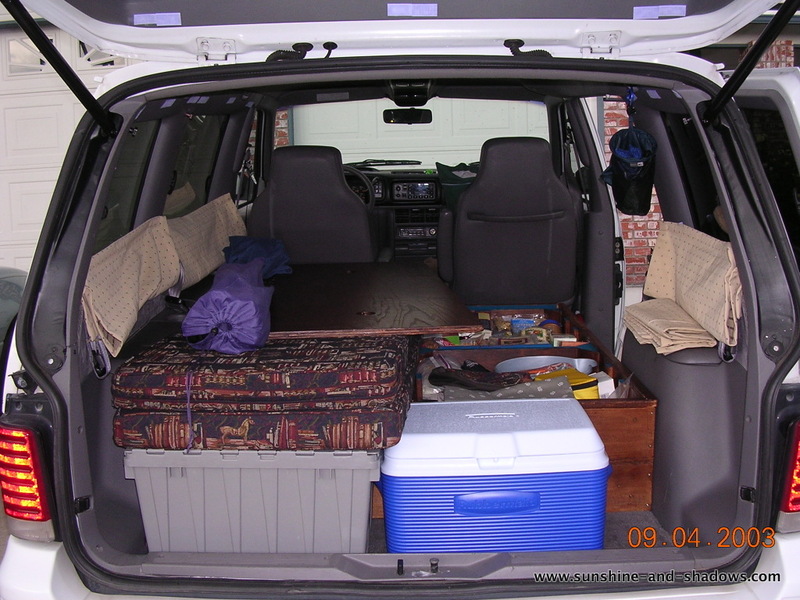 After graduating from college, Peter and I set off in my minivan to travel the country. We outfitted Eileen with a platform bed frame built by Peter and his dad, cushions made by Grandma Emmi, and curtains made by my mom. It was incredibly cozy and astonishingly comfortable. Spacious? No, but we made it ours. Honestly, I missed it terribly when we were done with our trip and it reverted back to a regular car (and even more when we eventually sold it). There was something truly special about that little home on wheels. Here you can see the wooden platform with one of the lids off to show the supplies stored inside with the two cushions stacked on top of each other. The cooler and the cookstove are in the containers at the very front and the curtains are in their “retracted” position (they attached at the top of the windows at night). 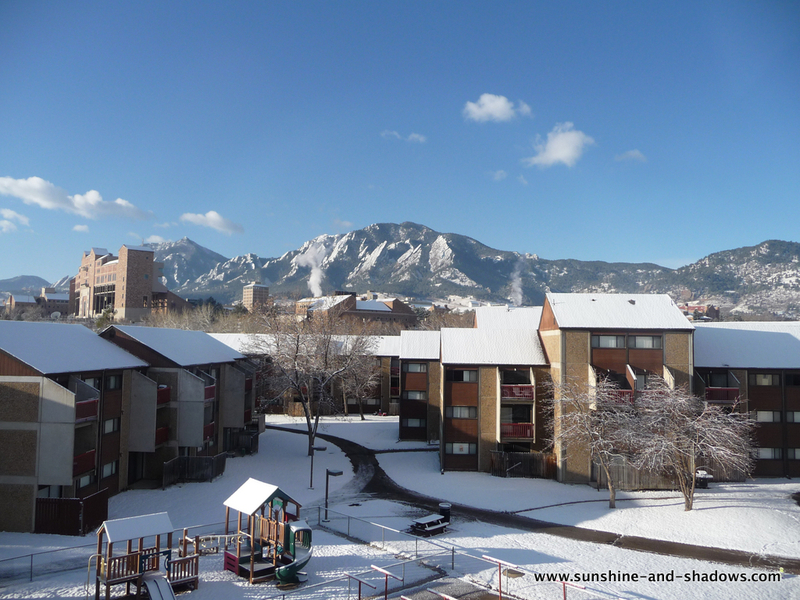 After we were married, our first home was in family housing in Boulder. The absolute best thing about that home was the opportunity to make friendships to last a lifetime, but a close second was the view. Those mountains are called the Flatirons and people pay lots of money to have a view like that one (although sans the playground, most likely). That apartment had a lot of… quirks. Asbestos in the ceiling, netting over the entire porch, truly hideous ’70s flooring and cabinets, but it was in a great location and it was our first home together. It saw us through two grad programs and lots and lots of homework. Then our condo. We renovated the kitchen completely on our own and took it from hideous to my favorite room in the house. It was also the first place we could have a dog, which we desperately wanted, so Jasper quickly became a part of our family. I’d always had a feeling that the second bedroom would someday become a nursery, even though technically our “plan” was to move before we needed such a thing. 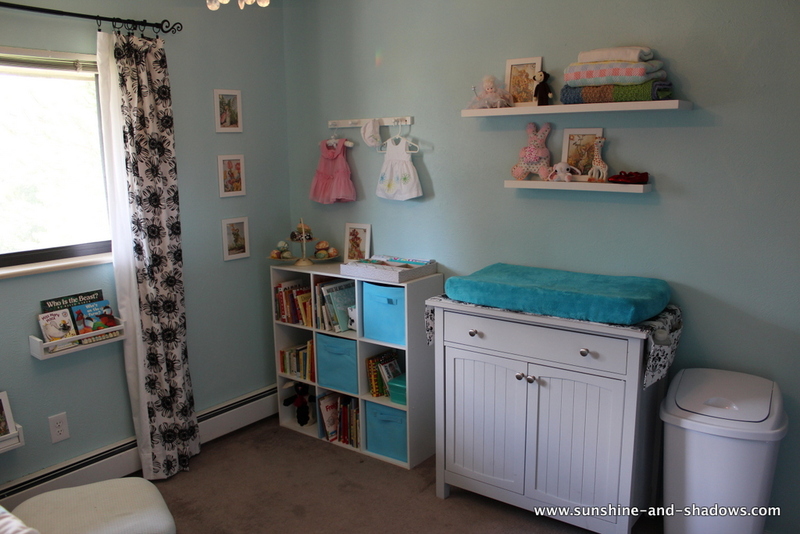 Then the day came when we did make it a nursery, and it was the sweetest room a baby ever came home to. It was wonderful to see Emmie begin to explore the condo as she grew. She learned to crawl in its hallway, learned to stand in the living room. She loved opening and closing the cabinets doors in the kitchen. She loved watching the fan in the bedroom and, most of all, loved watching the cars drive by at the window. And this will always be the only home where Grandma Emmi and Baby Emmie were together, watching cars drive by from the very same window. Now that we are moved into our lovely new home, and fall even more in love with it with each passing day, even as I look back fondly on all of our other homes, it makes me realize that the old saying really is true. Home IS where the heart is. Home is where my beloved and I lay our heads down together. Home now is where we raise our sweet little sprite. Home is where we make it. As I write this, thousands and thousands of homes are being threatened in our beautiful state, including homes of some dear friends in Boulder (they are somewhat safe for now, but not completely out of danger yet). It’s terrifying to see the flames leaping up and engulfing houses, and even more terrifying to see how many new fires are exploding daily. We’re in day 6 of record heat, and have had very, very little precipitation. If anyone feels so inclined, a rain dance, prayers, or other juju would be much appreciated.